The shooting took place in Baltimore's Sandtown-Winchester neighborhood. The young victim was taken into surgery, and her condition was unknown Tuesday afternoon. 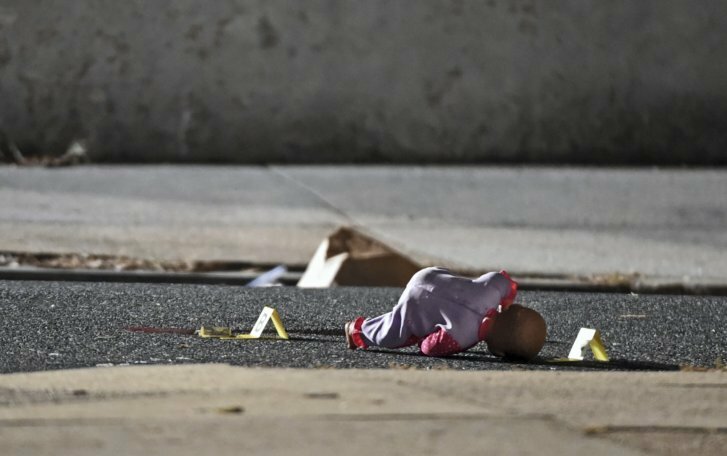 BALTIMORE (AP) — In the latest example of the punishing cost of Baltimore’s gang violence, a 5-year-old girl whose older sister was fatally shot in a spray of gunfire earlier this year was herself injured in the crossfire of bullets. Identified by relatives and local news outlets as Amy Hayes, the child suffered a gunshot wound to the groin as she walked to a corner store Monday evening in West Baltimore. She was rushed to a hospital for treatment and was reported in stable condition Tuesday after surgery. The wounded girl is the younger sister of Taylor Hayes, a 7-year-old who succumbed to gunshot injuries in July after being shot while in the backseat of a family friend’s car. A woman behind the wheel of the car where Taylor was shot was charged with possession of heroin, a digital scale, and a loaded .40-calibre pistol with an extended magazine in her glove box. A 29-year-old man was later charged with murder in Taylor’s death and is awaiting trial. On Tuesday, acting Police Commissioner Gary Tuggle voiced exasperation with the endless tide of retaliatory shootings in poor neighborhoods like the Sandtown-Winchester area of West Baltimore where the 5-year-old was wounded. “We’ve got to do more. Not just as a police department but we have to do more as a community. We have become so desensitized to the level of violence in this city that it is just totally, totally unacceptable,” Tuggle told reporters at police headquarters. In the absence of any solid leads regarding Monday’s shooting, investigators are trying to enlist the support of local residents to find those responsible. The suspects were believed to be in a car and on foot. Police and various others were planning on walking through the neighborhood where Amy was hit as a show of solidarity. When asked what detectives knew at this stage, Tuggle wasn’t able to offer much other than he’s confident the youngster “was not targeted” by gunmen. “We know that it was a shootout in the area. We don’t know the motive. That’s why we’re enlisting the support of the community,” he said. In an interview with The Baltimore Sun , the young girl’s great-grandmother, Vivian Nealy, said Amy had celebrated her fifth birthday four days before getting shot. She was walking to a corner store to buy juice, thirsty from eating sunflower seeds, when she was wounded in the crossfire.